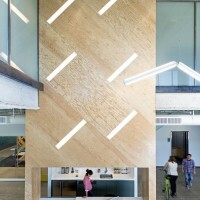 Studio O+A have designed the offices of Evernote in Redwood City, California. 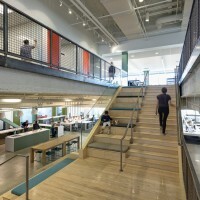 At Evernote in Redwood City, California, the strict budget and swift pace of construction helped determine the direction of the design. 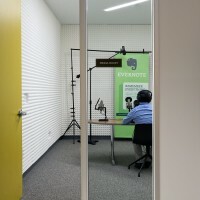 Evernote is an online data storage company that allows its users to save (and retrieve) everything from Post-It notes to photographs to formal documents in the Cloud. 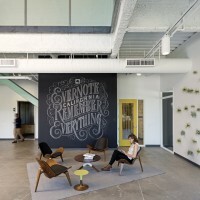 With the company moving into a much larger building than it had previously occupied, and with business booming, Evernote needed to be up and running in its new space with a minimum of downtime. Our challenge was to design an office commensurate with Evernote’s soaring profile—on what was essentially a start-up budget and schedule. We began with the concept of making the process of construction part of the aesthetic. In a clean and modern context, construction materials may acquire the design impact of richer finishes. Evernote’s coffee bar and break areas are clad with Douglas fir plywood, the texture and grain of which provides its own graphic patterns. 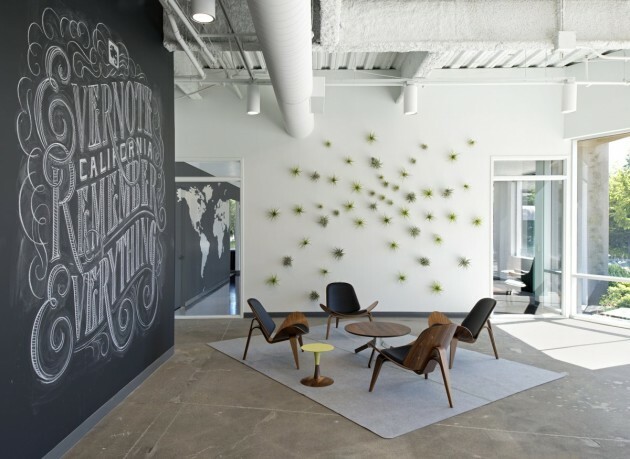 Forgoing expensive interior branding, Evernote instead hired chalk artist Dana Tanamachi to draft a wall-sized representation of the company’s identity, complete with its tagline, “Remember everything,” and elephant logo. 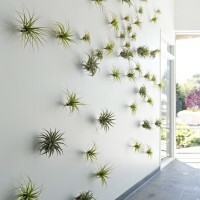 Low-maintenance, water-conserving plants on an adjoining wall contribute to the reception area’s look of unforced spaciousness. Adding to the informality is the placement of a coffee bar—with fully functioning donut and pastry counter—at the reception station. An echo of Evernote’s mission of turning impulses into lasting archives of information, our design transforms the spontaneous habits of its staff (grabbing a donut on arrival, for example) into a lasting element. This encouragement of spontaneity is reprised in the white ash stairway that connects the second and third floors. The wide staircase is fitted with cushioned step seating to make it a natural gathering place and area for relaxation. 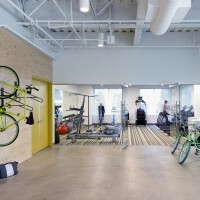 There are other spaces for breaks and informal meetings throughout the office—a large communal dining room; a ping-pong table; a designated fitness center equipped with treadmills, stationary bikes, and other exercise devices; and a series of small, strategically placed snack and coffee counters. The cumulative result of all these break options is an environment that promotes those casual interactions from which so many creative impulses spring. 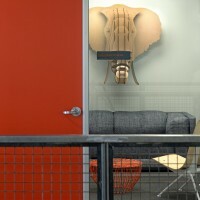 As befits a work environment attuned to informal collaboration, the finish palette for Evernote is light. White walls and pastel accents mix with blonde wood and lighting that augment the natural brightness of the windows to subliminally communicate the spirit of the company—and turn a tight-budget, tight-schedule build-out into something memorable.